*This column reflects the opinions of the authors about commercial academic publishing. Two institutions—learned societies and scientific journals—midwifed a scientific revolution in the 17th century that still dominates our professional lives today. Learned societies like the ASCB remain relevant because they provide forums for sharing results, discussing the practice of science, and projecting our voices to the public and the policymakers. Scientific journals still disseminate our work, but in the Internet-connected world of the 21st century this is no longer their critical function. Journals remain relevant today almost entirely because they provide a playing field for scientific and professional competition: To claim credit for a discovery, we publish it in a peer-reviewed journal; to get a job in academia or money to run a lab, we present piles of these published papers to universities and funding agencies. Publishing is so embedded in the practice of science that whoever controls the journals controls access to the entire profession. It is, therefore, worth examining to whom we have entrusted the keys to the kingdom of science. Today, this 400-year-old logo no longer reflects reality. As scholars, we now could take over the means of fruit production—in fact, we already do most of it. Like our intellectual ancestors hundreds of years ago, we still conceive and execute the research, and we write our papers. But now with the advent of electronic word and image processing, we also create our own graphics, proofread our own text, and in some cases typeset it. More significantly, the Internet enables us to easily (and instantly) disseminate our work around the world. Publishers still help provide a measure of quality control by orchestrating the peer review process, but here again it is scholars who do the actual work of reviewing papers. It is thus surprising that despite the diminished (and arguably dispensable) role of the publishing industry, our community remains slavishly committed to century-old traditions that, we will argue, are illogical and in many cases exploitative and harmful to our community. Of course Elsevier is only one example of several large for-profit publishers of scholarly journals. Members of the for-profit publishing industry subscribe to an ingenious business plan. In an insightful satirical essay, Scott Aaronson describes a fictitious computer game company built on principles similar to those of the for-profit publishing industry, exploiting its patrons to contribute their products and labor for free.2 In Aaronson’s imaginary scenario, game developers donate their games to the company because they need its “seal of approval” for their games to be recognized. Experts test and debug the games for free when told that it’s their “professional duty” to do so. So for only trivial investment in the products, the company can charge customers high rates for the games it now owns. Aaronson concludes: “On reflection, perhaps no game developer would be gullible enough to fall for my scheme. I need a community that has a higher tolerance for the ridiculous—a community that, even after my operation is unmasked, will study it and hold meetings, but not ‘rush to judgment’ by dissociating itself from me. But who on Earth could possibly be so paralyzed by indecision, so averse to change, so immune to common sense? The situation is amplified by the fact that publishers have created de facto monopolies. In this industry, normal market forces that control pricing through competition are entirely absent. Every paper we submit is a singular product, and every academic library has an obligation to provide access to it. Otherwise, we, the scholars, cannot perform our jobs properly, and it is the libraries’ role to support our scholarship. Because of this built-in mandate, publishers can increase prices virtually at will (at least, until library budgets are exhausted), which is strongly supported by data that show the increase in subscription cost far outpaces other market indicators.3 The only control in place is depressingly reminiscent of a parasite–host relationship: To ensure its own survival the parasite must not kill the host. Why having a monopoly on the product combined with a captive market for it does not violate antitrust law is unclear to us. To further compound the issue, we blithely accept the fact that most publishers demand that we sign over the copyright of our work, allowing them to control access to it and maximize their profits. If we were to imagine an updated logo befitting the current business practices of for-profit publishers, it might look something like Figure 2. The elm tree has grown, as the for-profit publishing houses now have grown into gigantic multinational conglomerates. The fruit of knowledge now hangs out of reach, even when we are stretched on our tippy toes. 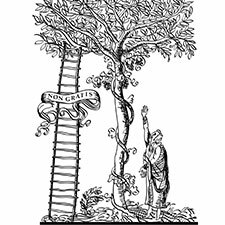 For access we need to use the ladder that is gated and festooned with the banner whose motto has morphed into Non Gratis (“not for free”). The role of the tree changed diametrically, from disseminating knowledge to controlling access. And yet, we happily keep nourishing the tree. Just as Scott Aaronson describes, we work for them for free in producing the work, reviewing it, and serving on their editorial boards. The magnitude of the profits of the major commercial publishers is astonishing. As a whole, the industry made more than $10 billion in 2015, with profits for the largest players, such as Elsevier, Springer, Taylor & Francis, and Wiley, exceeding 30%.4 Elsevier alone, a publicly held company and the world’s largest academic for-profit publisher, reports in its 2014 annual report revenues of $3.38 billion for its science/technology/math branches with an operating profit of $1.13 billion.5 This calculates to a profit margin of 33%. In other words, each time we pay an article processing charge of $3,000, $1,000 goes to Elsevier and its shareholders. Putting these numbers into perspective reveals the magnitude of the problem: Elsevier’s annual profit of $1.13 billion corresponds to ~1.3-times the entire annual budget of the Howard Hughes Medical Institute (HHMI), the major philanthropic funding agency for biomedical research in the United States, which generously funds some 300 investigators. The CNRS, the major funding agency in France, spends €30M/year on journal subscriptions (~20% of its entire annual budget allocated for consumables and small equipment).6 This money is effectively a surcharge, or tax, on scientific research imposed not by a government but by a for-profit industry. Imagine for a moment how much research could be carried out using these resources if they were channeled back into our academic enterprise. Most of us pay publication charges from our grants, that is, from taxpayers’ money. And then the libraries, again funded indirectly through the taxpayers, pay again for access. In open-access models of our for-profit publishers, things are hardly any better. Elsevier’s Cell Reports charges $5,000 to publish an article. Thus, while foregoing the library subscription income, the shareholders’ profits are well preserved in the aggregate of their portfolio. But at least open access allows us to evaluate the price tag up front. Scientists can decide on a case-by-case basis whether any particular journal is worth that much money, and publishers cannot lock away our papers in their archives, holding them ransom and charging our community for access over and over again. Figure 2. 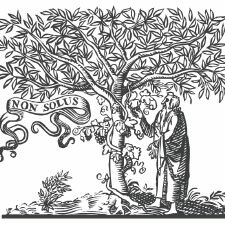 The authors’ satirical view of the Elsevier logo: The tree has grown (AD 2016). In contrast to for-profit publishers, our university presses and society journals use the more modest profits generated from their journals to leverage many positive initiatives that enrich our communities, such as the prestigious EMBO Fellowships that would not exist without the revenue brought in by EMBO journals, the impactful AAAS Science and Technology Policy Fellowships built on leveraging the income generated by Science magazine, and the various activities of our Society enabled by ASCB’s Molecular Biology of the Cell (MBoC). These enterprises add to the larger good of our community values, and they deserve our support and volunteered labor. All of the issues mentioned above have been raised ad nauseum. They have caused flurries of outrage across a range of academic communities, yet the issues persist in the face of boycott attempts and editorial board resignations (e.g., reference 7). Why do we not only tolerate an antiquated and patently exploitative publishing system, but actively support and promote it? Why is our community so resistant to see through these issues and effect meaningful change? There are a number of reasons that contribute to maintain the unfortunate status quo. As the story goes, a lot of money is made by those who offer to print stars onto the bellies of those lacking them, which as status symbols are just as meaningless as a paper in a high–impact factor journal on our CVs as an indicator of signature contributions. What desperately needs to be done is to eradicate the misleading metric of the journal impact factor, and this movement is well underway. Alternative, article-based (i.e., not journal-based) metrics are gaining hold and acceptance as an improvement, although even this is not enough.10,11 One of us (PW) serves on a grant evaluation panel for the European Research Council (introduced in the President’s Column in the preceding issue of this Newsletter12). In our panel it is the stated and adhered to policy that we will not consider where a paper is published. Rather, in our evaluations we assess its real impact in a field. Change of this sort and defiance of the status quo is badly needed in all committees and panels that make decisions that impact the future of our next-generation scientists, even if it entails a bit more work. Even if the highest-profile journals may not be the biggest money-makers for the publishers, their business practices of bundling subscriptions and creating ever-expanding suites of high-profile spin-off journals rely on them as very profitable hooks for maintaining market share. Second, we as a community lack the will and the courage to act together for change, even change that would improve our lives. We could, for example, overhaul the publishing system overnight, by sending our work exclusively to non-profit venues that provide either immediate open access or that return their revenues to the scientific community. Journals like PLOS, eLife, and MBoC provide arguably better standards of peer-review than for-profit journals and unarguably better access—namely free access either immediately or soon after publication for anyone with an Internet connection. The only thing these journals still lack is our highest stamp of approval. And there’s the rub! As long as a significant fraction of the research community remains in awe of vanity for-profit journals, these journals will retain their hold on the keys to the kingdom. We are evolutionarily programmed to nourish and protect our young and many of us continue to publish in journals of questionable ethics because: “I/my student/postdoc need(s) to publish in such a journal to get a promotion/job/grant.” As a community, we remain in thrall to these magazines. We may imagine ourselves to be rational, gutsy, paradigm-changing experimentalists who go where no one has gone before, but in reality we are a conservative community to which change does not come easily. There is hope for gradual change and enlightenment, but all of the rational and well-reasoned cries of outrage have not led to a revolution. Third, the beneficiary of the current system is a multibillion-dollar industry whose influence is so strong that the institutions funding our research are unwilling or unable to counter it decisively. The research community itself may lack the courage to stop publishing in for-profit journals, but public funding sources like the National Institutes of Health (NIH) could make this change overnight by demanding that all publicly funded work be made freely available immediately or shortly after publication. So could the other major funding agencies around the world such as the HHMI, the Wellcome Trust, the CNRS, and the Max-Planck-Institutes. Instead of removing the industry-imposed tax on research, however, our funding institutions reached compromises that allow for-profit publishers to retain exclusive rights to charge for access to publicly funded work for one year (e.g., see reference 13). With so many accessible publishing options available is there really a compelling need to compromise on this issue? Akin to those politicians who deploy demagogic talents to convince national electorates to vote against their own interests, for-profit publishers bring enormous resources to bear and “convince” policy makers, funding agencies, and researchers that their services are invaluable, and that their practices and profit margins are fair and justified. Fourth, the publishing landscape is complex. It is imperative for us to adhere to our academic mission of making sure that scientific contributions are properly reviewed and refined so that our published work represents reliable, true advances of knowledge—to the best of our communal ability to judge. For that, we have accepted a communal responsibility, reflected in the many altruistic ways we volunteer our time and effort. These are powerful traditions that we deeply value. It is not always easy to see clearly when these values are being abused. Perhaps it is this that allows for-profit publishing companies to continue to flourish with a business model that exploits and manipulates our community values for financial gain. Fifth, the editors that work for journals run by for-profit publishers are not our enemies. These editors, many of them talented scientists trained in our own labs, learned to recognize good science, to identify faulty logic, and to distinguish significant discoveries from incremental advances. We value them as colleagues and, for the most part, they do their best to handle submissions fairly while upholding the prestige of their respective journals. Yet, some have become corrupted by their masters and act more as powerbrokers judged by their efforts to maximize the journals’ impact factors rather than their work as scientists and mentors practicing the art of rational, evidence-based decision-making. This list describes a few of the many reasons why we put up with unnecessary and exploitative practices of for-profit scientific publishers. Perhaps evolutionary genetics provides a relevant lesson: Traits that are harmful to an entire population can persist for long periods of time when they provide individuals in that population with a survival advantage. So, how do we change the system? Box 1. Suggestion for a reply when asked to review for a for-profit journal. Note that the suggested rate for professional advice is a bargain. It would be very hard to find a lawyer to work for this rate for a for-profit enterprise. Obviously, we cannot expect publishers themselves to initiate significant change. The executives of for-profit publishing companies are obliged to maximize profits, which in this case means extracting publicly and philanthropically provided resources from the scientific community. They cannot suddenly abandon their fiduciary responsibilities and begin plowing profits back into universities or the research community. The evolution from symbiont to parasite is complete and irreversible. Starting small with individual actions helps with another malady in our profession: the constant struggle to maintain a good life–work balance. Imagine, for example, what you could do with four hours. You could either review a paper and put money into the pockets of canny investors, or you could spend some quality time with your family, go for a walk, or perform some unpaid community service that actually makes the world a better place. If you really want to review that paper, there is another strategy that could turn the ethical dilemma into a win–win situation (see Box 1). COLLEAGUES, TEAR DOWN THAT TREE! And if we scientists fail to tear it down in one blow, then let us at least open our eyes and continue to chop away at it. The end goal seems obvious: The knowledge that we produce in our publicly funded works belongs to humankind and must not be locked up behind pay-walls— newly submitted papers should be open-access and older ones open-archive. Our real challenge is to find the paths that get us there. But major change can happen, even if it seems impossible to imagine now. The Berlin Wall no longer stands, and we are certain that—if we put our hearts into it, embrace healthy values, and eradicate bad ones—scientists, learned societies, and scientific journals can invent new, powerfully symbiotic relationships. 2Aaronson S (2007). Review of The Access Principle by John Willinsky. ACM SIGACT News 38, 19–23. For an online author’s copy of the article that is not behind a paywall see: www.scottaaronson.com/writings/journal.html. 4Murphy K (March 12, 2016). Should all research articles be free? The New York Times. www.nytimes.com/2016/03/13/opinion/sunday/should-all-research-papers-be-free.html. 5see p. 102 in www.relx.com/investorcentre/reports 2007/Documents/2014/relxgroup_ar_2014.pdf. 9Geisel T (aka Dr. Seuss) (1961). The Sneetches and Other Stories. New York: Random House. For an online copy of the entire prose see http://teacherweb.com/VA/WarwickHS/Elliot_T/Text-The-Sneetches.pdf. 12Hyman T, Desai A, Walter P (2016). On research funding and the power of youth. ASCB Newsletter 39(7), 3–8. www.ascb.org/october-2016-newsletter-on-research-funding-and-the-power-of-youth. 14Bourne HR, Vermillion EB (2016). Follow the Money: Funding Research in a Large Academic Health Center. University of California Medical Humanities Press. 18Bohannon J (Dec. 11, 2015). In unique deal, Elsevier agrees to make some papers by Dutch authors free. Science. www.sciencemag.org/news/2015/12/unique-deal-elsevier-agrees-make-some-papers-dutch-authors-free. 19Bohannon J (April 28, 2016). Who’s downloading pirated papers? Everyone. Science. www.sciencemag.org/news/2016/04/whos-downloading-pirated-papers-everyone.